A friend from college recently made a transition from the States to Norway a contacted me for any advice I could give about making the big move. I offered some (what I hope was helpful) advice based on our own experience of arriving in Amsterdam; and it got me thinking about the good, bad, and stupid packing decisions we made for our suitcases. 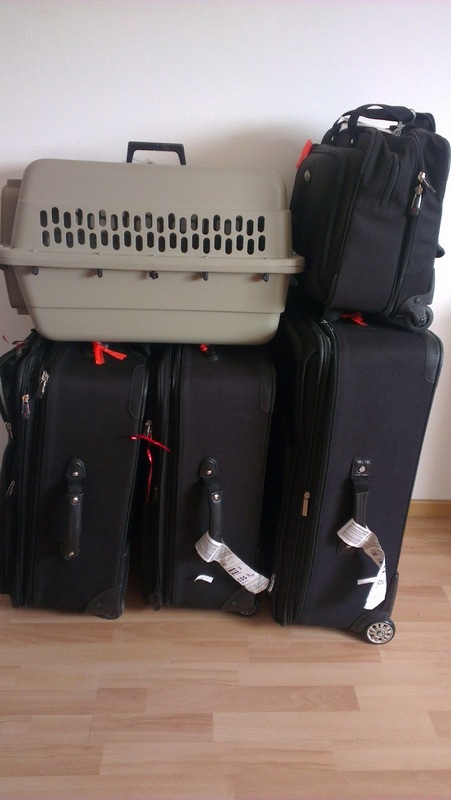 When we flew to the Netherlands for the move, we used IcelandAir because of the ease of adding the cats onto our itinerary. Since it was a trip that originated in the States, each passenger was allowed 2 checked bags and the carry-on - in my experience since then, trips (even round-trips) from Europe to the US only allow one checked bag per ticket, and a second bag is charged. Our moving day suitcases were based on the 2 checked bags expectation. Some of our moving day suitcases. 1 additional cat carrier, 3 carry-ons, and stroller. Cat food and bowls. Since we were moving with "the boys" we had some cat food in a 2 gallon ziplock bag and their dishes. This ended up being great since they could eat as soon as they settled their nerves AND we didn't have to figure out buying cat food for a few weeks. With all the other things we had to think about, delaying this detail was helpful. Bed sheets and towels. We didn't have real beds when we arrived, but our very kind relocation company provided a blowup bed and toddler bed for us while we made our furniture purchases. They also provided sheets, but it was great to have an extra set "just in case" and while we washed and dried a set. We also brought a towel for each of us, so we could take showers when we arrived. Thanks goes to my mom for thinking about these items before we boxed them up for the shipping company. Adapters and universal power strips. When we arrived, we were able to plug in our computers and iPods, so we knew what time it was. At first we did this with standard plug adapters. But as we slowly acquired European electronics, we used the power strips so we could have the computers (with North American prongs) and the CD player (with European prongs) plugged by the same area without too much confusion of cords. And since we bought the "universal" style, when we ended up with a clock for Little Man with UK style prongs and could plug that in with the lamp we shipped from America. NOTE: Check the voltage and Hz capabilities of your electronics before packing. Plugging in something that doesn't fit the requirements of your new home will "blow" and possibly provide a few exciting moments in your electrical education. Winter clothes. Because we live further north now, it started getting cooler earlier in the year. Our shipped items hadn't arrived yet, but we were already digging into the suitcases for sweaters and sweatshirts. This probably isn't necessary if you're moving to on/near the equator. E-Reader. Our stuff (including all of our books) didn't arrive for nearly 2 months after we did. During that time, we also hadn't bought a TV or most of our furniture. Since Little Man was still taking 2 hour naps in the afternoon and Mark was at work, I read during nap time. I made it through the first four books in the Game of Thrones series, three Jane Austen novels, Jane Eyre, and the Anne of Green Gables series before our things arrived. Despite your feelings towards the "classics" this was far better than twiddling my thumbs and staring at the cats during nap times. All the sippy cups. We had five sippy cups at the time. We didn't have to worry about finding a new one if one was lost, and we could let them "air out" after being washed before the next use. 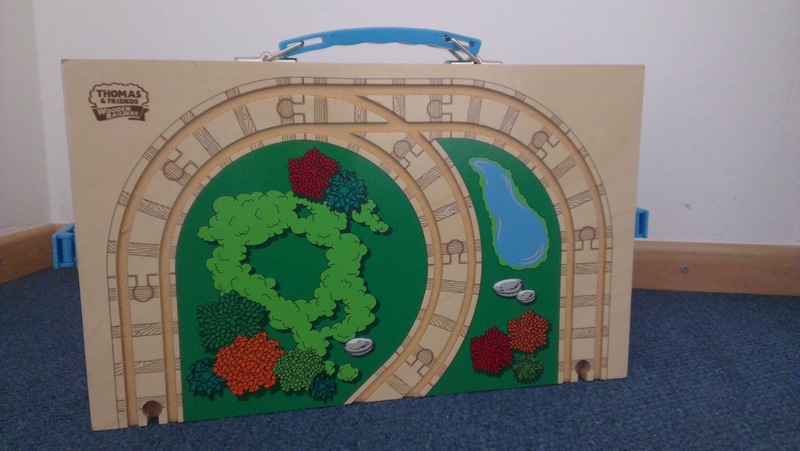 Travel toy train case with built-in track. This was a bigger item to shove in the suitcase, but I'm glad we did. We bought it before we left Chicago specifically so Little Man could take some of his trains without having them scatter all over the inside of a carry-on and make a nuisance. We also didn't have to deal with loose pieces of track since it's built into the case. The train case. One of the better purchase- and packing-decisions I've made in my lifetime. We didn't pack the shopping bags. I was participating in my own small scale "SAVE THE EARTH!!!" campaign in Chicago and I had a bunch of reusable shopping bags, which I shipped. In Europe, they've already transitioned to charging you for purchasing plastic shopping bags to cut down on waste and costs. I already knew this, but it slipped my mind when packing. I ended up buying another reusable bag upon arrival, and added it to the collection when the rest of our stuff arrived. We should have brought more cash. We knew there were differences between North American and European debit and credit cards, but we had no idea how drastic those differences were. In addition to the strip on the back of the card, European cards have an extra chip on the front of the card that is typically what the debit machines are reading when you make a purchase. You can use your North American debit card at the ATM, but not in the stores. Likewise, without the chip on the front and a PIN code, many places cannot process a North American credit card. This was an interesting realization at the register at IKEA when trying to make a big purchase. We made it through the wait for our European debit cards to arrive, but navigating the money differences was a bit stressful. We didn't pack any plates, cutlery, cups, or a pan. We should have kept a cheapo-reusable plastic plate and cutlery setting for each of us instead of donating them all. Likewise, we should have packed at least one mug for each grownup. And we should have packed at least one pan and cooking spoon. We realized upon arrival that we had no way of cooking or serving food. So after the kind relocation folks escorted a dazed and jet-lagged me to the grocery store for some essentials, they took me to another store to buy some cookware so we wouldn't go hungry during our first few days. Why I thought of it for the cats but not for us is still beyond me. Five children's books wasn't enough. Seriously. After 2 months of reading the same five books over and over, I think I can still recite them nearly a year later. Even Little Man had no interest in them for months after all his other books arrived. Any thoughts from those that have made the "big move" before? Your good/bad/stupid packing choices, advice, and stories are welcome! I'm not sure if your friend has the luxury of a relo company. Ours placed our Ikea order for us- so the beds, couch and kitchen table were here waiting. I too brought our sheets (laundered). That was probably the best thing- that these were waiting for us and we didn't have to stay in a hotel. They even had cups, plates and a set of forks and knives! Dumb things I packed: Far too many clothes for the boys, not enough school outfits, and not enough toys. I too know the pain of having the same ol stuff for 4 weeks! We ended up buying things here and there- and when our 'real' toys arrived it was just so much stuff. We ended up buying a bunch of paper, crafting, glue types of stuff after we arrived. Without the toys and normal crafting stuff, I ended up creating all sorts of weirdo-looking paper animals to play with. What a great post! We did not pack any of our printed photos / frames and I really regret that now. Thanks! Our shipped pictures and frames mostly all made it. We have most on a disc and/or drive but I don't like thinking about what could have happened on the way over. I was lucky in a lot of ways, because my boyfriend is from Italy originally and he flew over to Italy first and packed up lots of plates, glasses, towels and a few other helpful odds and ends and then drove here to the NL before the big move. He was also able to go to Ikea and buy mattresses and a dining table so they were ready for us the day we arrived. I think it is good to plan for at least two months of waiting for stuff to arrive, so pack accordingly. We did buy a tv once we moved here, but also had to wait a month or more for our sofa. Seating was less than comfortable! I was ruthless in getting rid of stuff when we moved, but I wish I'd brought a few more of my kitchen supplies. I had such a well-stocked kitchen in the US and there are small things that I hate to buy again for occasional use, but also miss having for those rare occasions,such as piping bags, cooking rings, and such. I also wish I'd brought a few more of my decorative tchotchkes to help put my own stamp on the place sooner. I agree with planning for 2 months without your "normal" stuff. I think if I had appreciated that more, I would have packed more than 5 kid's books. And I know what you mean about the tchotchkes - the place seemed so bare and sterile the first couple months without them!